The Traditional and most effective method for learning Ashtanga, originating in Mysore, India. The teacher moves around the room, working one-to-one with each student, guiding you through the Ashtanga Yoga system – The experience is like having a private lesson in a group setting. You will receive lots of hands on help and you will never be out of your depth. Absolute beginners to Advanced practitioners welcome. No booking necessary. This class is suitable for students who have completed the Six Week’s Beginner’s Course, or have some yoga experience, of any style. Complete beginner’s are welcome to try it, if you are up for a little bit of a challenge. The class includes sun salutations, standing poses, the first half of the seated poses of primary series, and finishing poses. No booking necessary. The primary series is a challenging and invigorating sequence of postures that take about an hour and thirty minutes to practice. The postures are strengthening, toning and cleansing for the muscles, joints and internal organs. During the primary led classes, the students are guided in unison through the postures of the sequence and provided with variations of poses that prove challenging. The class includes postures, breathing, and chanting. No booking necessary. All beginners courses need to be booked in advance of course starting. 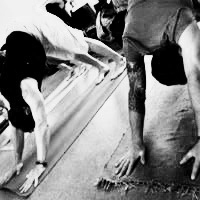 Book one-to-one tuition with Digby Platt – Director of Stonemonkey & YAUK Senior Yoga teacher. Enjoy a 1.5 hr private session with Digby at the Stonemonkey studio including 2 follow-up self practice classes. These sessions can be for complete beginners to Ashtanga Yoga or for those coming back from injuries or just wanting to take a deeper look at their existing practice. Many people have taken these sessions over the years and have enjoyed the personal attention and direction in helping them to gain an understanding of Ashtanga Yoga. The 1.5hr one-to-one can be scheduled on a mutual agreeable time and date with the follow up classes to be taken within a 6 month period following the first session.